Engineers began pouring concrete for Yangjiang 5 yesterday. The new power plant in China's Guangdong province is the largest nuclear construction site in the world. The start of the project represents the latest iteration in the mass deployment of nuclear power across China. Work on the first reactor at Yangjiang began in December 2008 with subsequent reactor construction following in 2009 and 2010. China's post-Fukushima hiatus in new reactor approvals meant the start of construction at unit 4 was delayed until the end of 2012. 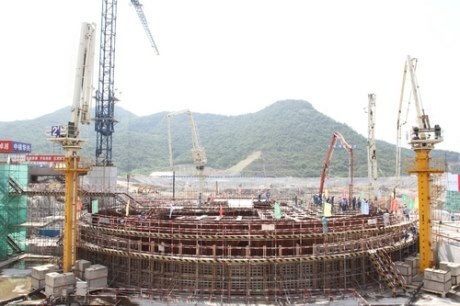 The resulting high rate of work at the site, in a headland near the mouth of the Yang river, caused planners to delay first concrete on unit 5 by about a month to avoid having an impact on the late-stage construction work at units 1 and 2. The start of concrete pouring was announced yesterday by China Nuclear Engineering Corporation, which said it would take 45 hours. The first four Yangjiang units are CPR-1000 pressurized water reactors, with unit 5 being the more advanced ACPR-1000. The site's final unit, number 6, also to be an ACPR-1000, is slated to start construction next year. All the reactors should be in operation by 2018, producing a grand total of around 6100 MWe.